The Epiphone Casino debuted in 1961, and it didn't take long to find its way into the hands of many of the most well known and highly regarded musicians of the 1960s. The situation is the same today, as the Epiphone Casino has a hell of a lot to offer the guitarist. 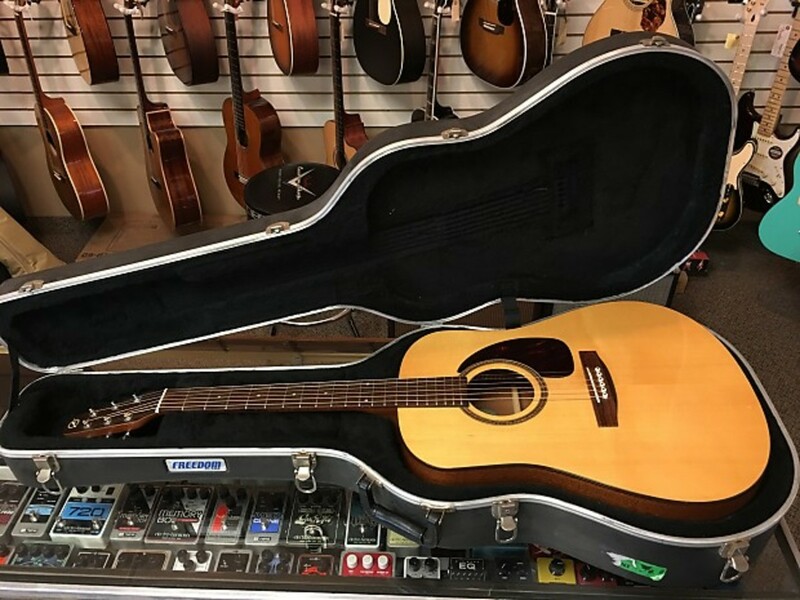 The guitar provides a very suitable tonality for a wide range of music, allowing for a guitarist to use the one guitar to cover genres ranging from country and western to heavy blues. When you look at the Epiphone Casino you may think the guitar is Epiphone's version of the more famous Gibson ES-335. This is not the case, as the Casino is built very differently on the inside. You see, the Epiphone Casino is not a semi-hollow body guitar, it is in fact, a true hollow body guitar. Semi-hollow body guitars have a solid center. 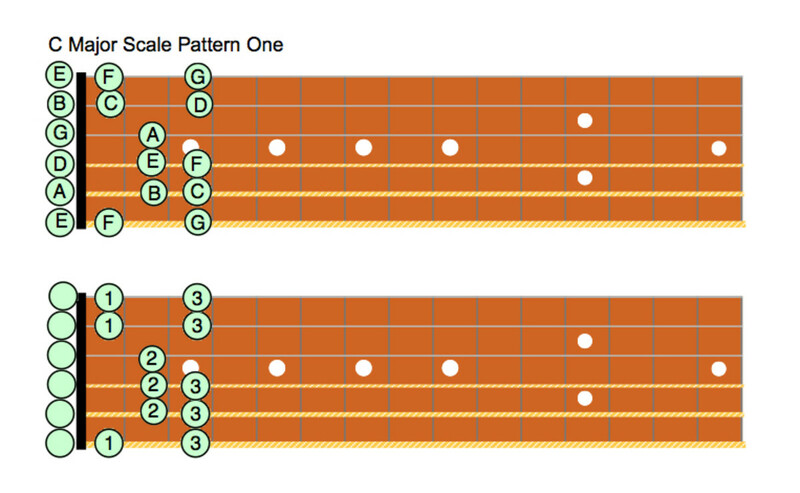 The solid center aids in creating more sustain for notes plucked, and it also aids in reducing feedback. The Casino is all hollow body, with no solid center. As a true hollow body, the Epiphone Casino will produce more volume when played unplugged. So in this way it is a more useful guitar for practicing with. Plugged in, the thinline hollow body Casino will sound quite different from an ES-335. The trapeze-style tailpiece comes standard on the Epiphone Casino and many other guitars like it. It's a very old school retro cool bit of hardware. But when it comes to old school retro cool hardware on classic guitars, probably nothing is so as much as a Bigsby vibrato. So many persons had a Bigsby installed on their Epiphone Casino that it soon became a factory option, and still is today. 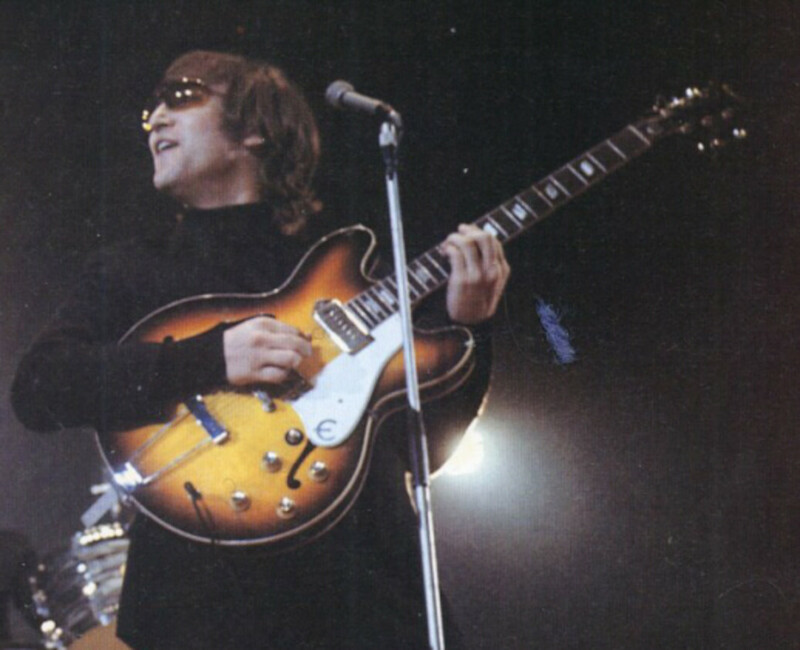 John Lennon with his Epiphone casino before modifications while with The Beatles. The Epiphone Casino is also known as model E230TD. It comes with two P90 single coil pickups.P90 pickups are still widely desired to this day. They've got a cult following. People tend to either love them or dislike them. The earlier versions of the Casino had a spruce top, which is highly unusual in electric guitars. But because the Casino is a thinline the use of spruce wouldn't have been odd at the time of its first production. Today most of these guitars have maple tops. In 1965 The Beatles were on top of the world. They were the biggest musical act in the entire world, and Paul McCartney got his Epiphone Casino that year. It wasn't long before George Harrison and John Lennon acquired their own too. From the day John Lennon got his he never looked back. 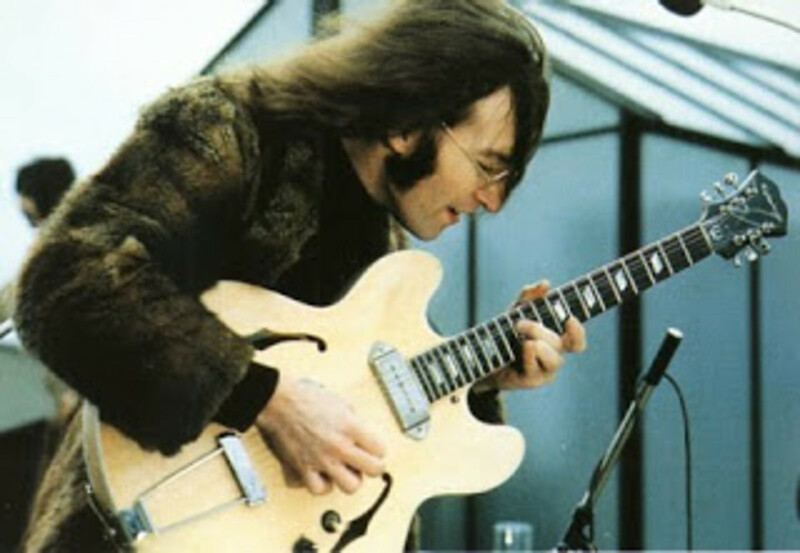 He used his Epiphone Casino as his number one guitar for all his playing until the end of The Beatles. John Lennon kept playing his guitar in his post Beatles work. He absolutely loved the thing as though it were truly a part of him. And he always used the same one, but he did have the original finish sanded off down to the wood, and a clear coat lacquer applied on top. He also removed the pickguard. The Lennon estate owns the guitar to this day, and displays it in museums from time to time. Epiphone has reproduced its Casino guitar in honor of John Lennon in both its forms. You can get one like John had before he modified it, and you can get one like John's with John's modifications. What a wonderful guitar for well under one thousand dollars either of these two would be! I don't think people realize how very reasonable are the prices of new and used instruments as these. Yes, they are currently manufactured in China. This is why they are so affordable. 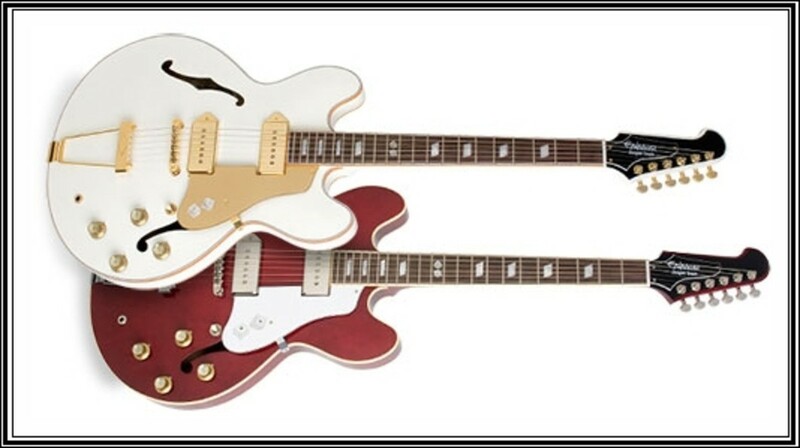 These inspired by John Lennon guitars are not currently in production. Don't be surprised if Epiphone makes another batch of them though. They are widely available for sale online in all the usual locations. I've seen them priced from four hundred and ninety nine bucks all the way up to eight hundred and ninety nine. The high priced ones were, of course, in mint condition and possibly never before played. The differences between the two are only on the surface. With or without the sunburst finish, and with or without the pickguard. The rest should be absolutely identical in every way. Dwight Yoakam wanted a signature series Casino, but he wanted it to have a Gibson Firebird style head-stock. Well, Dwight got what he wanted. And whether you believe it or not, the alternate style of headstock changed the tonal character of the guitar some from the standard. If you watch the video Dwight talks about all of this. He starts out playing and demonstrating his Epiphone elitist Casino, but then switches to his Dwight Trash one. The Dwight Trash guitars were made in Japan. Typically the only Epiphone guitars made in Japan are made there, and sold only there. Still, these guitars are priced well, but considerably higher than the Lennon guitars. The Japanese craftsmen demand higher wages, and according to most people, do a better job than Chinese guitar manufacturers. A big part of why these instruments are sold for so little is the use of laminated maple. Not only are the backs and sides laminated, but so is the top. Were we dealing with a guitar which was not meant to be primarily a guitar played while plugged in, then laminated woods would be an issue. But because these guitars are meant to be utilized with amplification, the laminates become a non-issue. The guitars will still be loud enough for someone to play unplugged by themselves while practicing or creating music. The great state of Texas has its own music scene, and a long history of having great blues guitarist call the place home. Gary Clark Jr. is quickly becoming the most relevant and widely known young blues guitarist in not just the state of Texas, but everywhere. Even President Obama is a fan, and will tell you so too. You've probably seen and heard Gary Clark Jr. even if you don't realize it. He is really getting around these days, but a lot of the time he's playing in the background as a supporting musician for more famous persons. But Gary's own work is thriving too. His primary guitar is the Epiphone Casino. And so the good people at Epiphone have worked with Gary to produce a model with his name on it, the Blak and Blu. In actuality there are two Gary Clark Jr. Blak and Blu Casino guitars. One is fairly standard with the trapeze tail-piece, and the other comes from the factory with the Bigsby vibrato. These are pretty classic and retro cool blues guitars Gary uses to bring the blues music of old into the modern day. These guitars are under a thousand dollars because they don't come with a hard shell case. The standard issue Epiphone Casino guitar is available in several colors, and is suitable for any level of skill of guitarist. Whether you play blues, country, jazz or rock, the Epiphone can handle it. The case is sold separately though. My thoughts are this is an outstanding first electric guitar for anyone, or it could be a great road guitar, the kind of guitar you take out to the clubs to play. Every guitarist needs a prize guitar they keep at home and then an affordable model they aren't afraid to take out into the public. This basic Chinese made ax can get the job done. Equipped with two vintage P-90 single-coil pickups, the Casino still delivers those Beatlesque tones at a price every player can afford. Made with a select maple body and top with f-holes, trapeze tailpiece, mahogany neck (24-3/4" scale), neck and body binding, two volume and two tone controls, and parallelogram inlays. Limited lifetime warranty. All of the Epiphone Casino guitars offer a great instrument at a very doable price, but the cream of the crop is clearly the Elitist. The folks at Epiphone apparently wished to avoid any possible ambiguity when they named the thing. Sometimes there is truth in advertising. The Elitist is made in Japan but sold internationally. These guitars will be every last drop of great as the originals from the 1960s. There are a lot of those old made in the USA Casinos out there on the market, by the way, but they cost three to five times what this one costs new. So if you're looking for the best deal in terms of a hollow body electric to play often, then the Epiphone Elitist Casino may very well be the exact guitar for you. 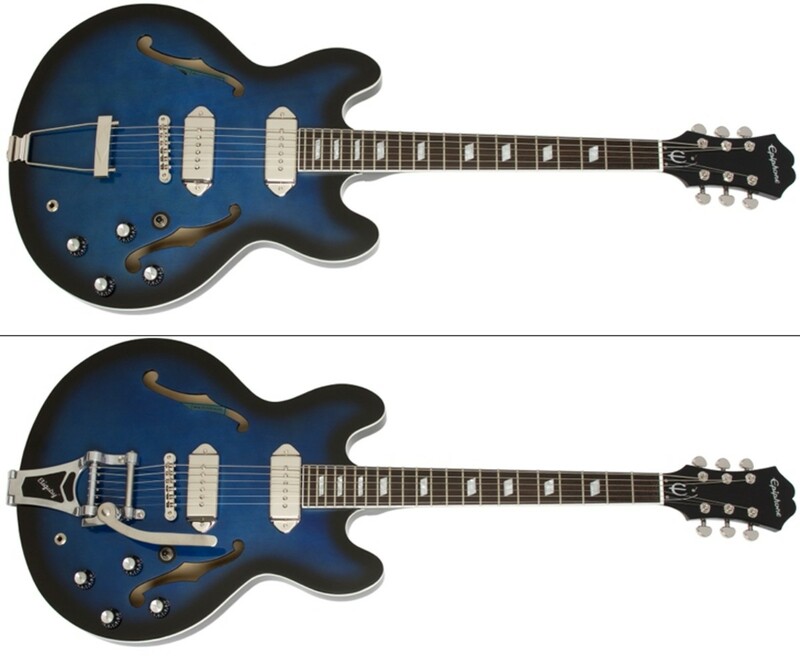 To be clear, you could buy at least two Gary Clark Jr. Blak and Blu guitars for the price. The Elite series guitars, however, are instruments that approach custom shop perfection. Crafted with premium woods, fitted with American pickups and circuitry”-even American-made toggle switches and Grover tuners--they're made at a special factory devoted to their manufacture where they receive a high degree of hands-on luthier attention. The Japanese are famous for building great products. And you can't honestly or objectively determine Japanese guitars as lesser than US made. When you study guitars as often as I do and you see someone is using an actual bone nut, you know the guitar is a very high grade instrument. Thanks Klaus. The thing about even well known models of guitars is, you never know all there is to know. You forgot one the John Lennon 1965 limited Epiphone Casino's. Only 1965 were ever produced is truly the holy grail of Epiphone Casino's Mine is #440 in vintage sunburst. Also own a Chinese made in natural, but the 1965 beats them all hands down! Wesman Shaw has a great gift of writing. He can make a guitar sound great and even his writing supports that! Once again--a great article!